In a previous post I showed how one could go about removing a button from a field type in Sitecore, and felt a complementary post on adding a new button to a field type was in order. In this post I will show you how I added a ‘Tomorrow’ button to a new Date field type — I duplicated the existing Date field type (you’ll see this later on in this post) — although I am uncertain how useful such a button would be. In other words, I’m not advocating the Date field type have a ‘Tomorrow’ button. I have created it only as an example. I overrode the HandleMessage() method above to ascertain whether we should handle the message passed to it — only the “contentdate:tomorrow” message should be handled, and this is passed when the ‘Tomorrow’ button is clicked (later on in this post, you will see how this message is associated with the ‘Tomorrow’ button in Sitecore) — and delegate to the base class when another message is passed, and that message is for the current control (this is when message[“id”] is equal to the ID property on the control). 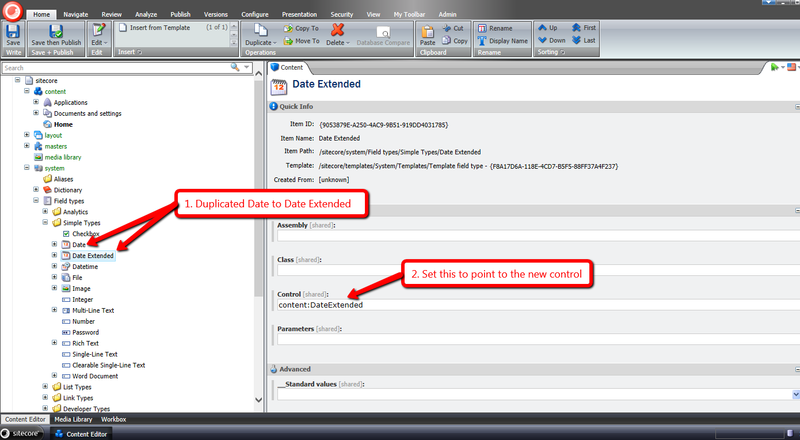 If the ‘Tomorrow’ button was clicked, we derive tomorrow’s date, convert it to the ISO date format, and set it as the value of the field via the SetValue() method which is defined in the Sitecore.Shell.Applications.ContentEditor.Date class. 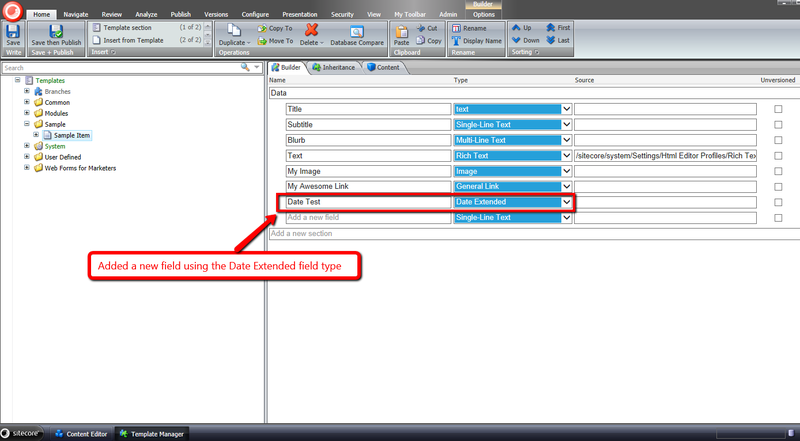 The Control field contains the “content” prefix defined in the patch configuration file above and the name of the DateExtended class — both are joined together by a colon. As you can see the next day’s date was set on the field. If you have any examples of where you had to add a new button to an existing field type, or ideas for new buttons that might be useful, please share in a comment. This topic has been in my queue for quite some time, and I felt it was long overdue for me to write something up about it. The idea for this post originated from a comment by Sitecore MVP Dan Solovay on my post covering how to resolve media library item aliases. Dan had asked about the business need for resolving media library item aliases. This question got me thinking: perhaps one might not want to resolve media library aliases. So what can be done to prevent media library items from being linked in Sitecore alias items? Well, you could remove the ‘Insert Media Link’ button from the General Link field type. You might be asking why I deleted the WebEdit Buttons folder which drives the insert link functionality for the Page Editor. Removing buttons from the Page Editor isn’t as straightforward as deleting items in Sitecore, and I might cover this in a future blog post. 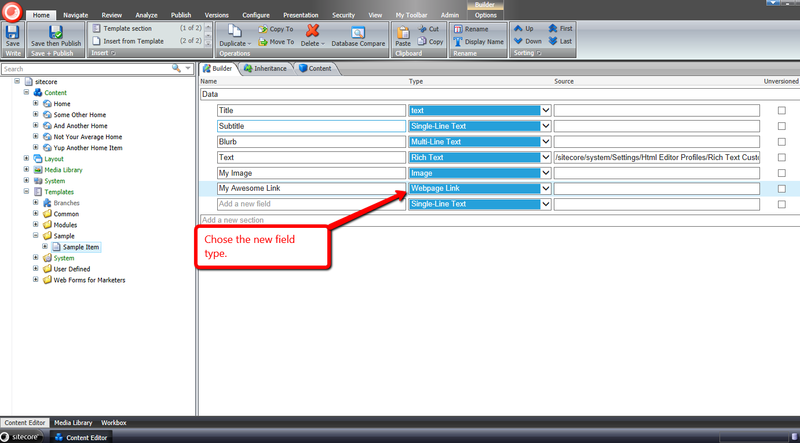 If you have any examples of where you had to remove buttons from field types in Sitecore, please drop a comment. In a future post, I will cover adding new buttons to field types — unlike this post, such a change requires adding code. Until next time, have a Sitecoretastic day, and Happy New Year!